The primary issue to be resolved is the port of Hodeidah, the main humanitarian pipeline, where coalition forces have been trying to dislodge the Huthi forces. The result has been horrific, with interruptions in the import of food, massive destruction and loss of life. Although at least 10,000 added troops were added by the coalition in recent months, most of Hodeidah still remains in Huthi hands. It is now known that the mercenary Sudanese troops used in the onslaught have been treated as cannon fodder by the UAE and have not been paid on time. There are reports that some have even killed their Saudi or Emirati commanders. Griffiths is hopeful that there will be a prisoner exchange between the two warring factions. 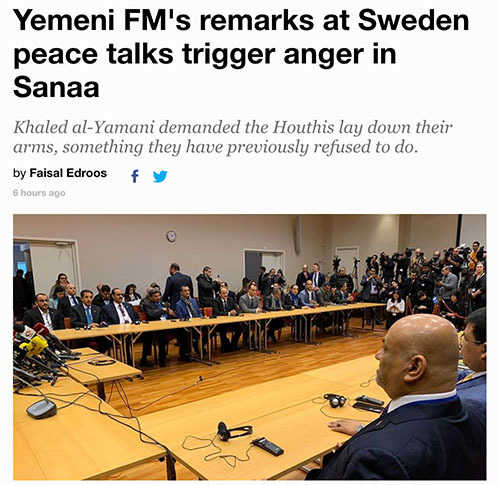 Beyond this, however, the opening salvo by Foreign Minister Khaled al-Yamani is pure war talk, reiterating the call for the Huthis to simply withdraw and hand over power to the government in exile. There is some irony that al-Yamani is talking tough when he is not even able to return to Aden, the one foothold that Hadi still believes he has. The problem was made by the UN in its resolution 2216, which called for reinstating Hadi rather than creating a scenario for peaceful resolution. Hadi has virtually no support in Yemen, including the south, where a transitional council is calling the shots. His legitimacy is only in the eyes of the international community, especially the major powers that are selling billions of dollars worth of weapons and military supplies to the coalition. The Huthis have agreed to let the UN take control of the port and also to stop their missile and drone attacks on Saudi Arabia and the UAE if the coalition stops their air attacks, now measured at over 18,000. The bluster of Hadi’s government is perhaps a desperate act now that Bin Salman is being accused of ordering the murder of journalist Jamal Kashoggi, which the CIA has affirmed and the U.S. Congress is acting on. Even the most conservative senators have lost all patience with the Saudi prince. The alliance between the Saudis and Israel is also fraught, not only because the Saudi public does not support it, but due to the criminal charges facing Israeli Prime Minister Netanyahu. Trump’s idea of a united front against Iran, playing into the Saudi propaganda machine, is well set, but it is obvious that Iran is playing a very minor role in Yemen. In addition to an immediate halt to the war in Yemen, there needs to be a secure path for provision of much needed assistance to lessen the humanitarian crisis. I hope that Griffiths can succeed. Neither side will ever have a military victory and the bloodbath has gone on for far too long. The fact that Hadi knows he has no future in Yemen will make this difficult. He is the Saudi puppet, so all it takes is for the Saudis to admit the obvious and let Hadi retire into a palace near Ben Ali. Unfortunately, this would allow the Yemenis to sort things out on their own, something the Saudi-led coalition fears. Let us hope that talking peace will drone out the futile war talk.